How biblical can it get? If you aren’t scared of a 2 degree rise (really, who is?) then be afraid, plagues of rats shall explode upon your house! The physics of climate change doesn’t have the same fear factor as the biology. … so populations will crash or explode as anthropogenic climate change continues to make wet areas more sodden and dry areas, more parched. … rats have a gestation period of 14 days. The babies can start reproducing after a month. That means that in one year, one pregnant rat can result in 15,000 to 18,000 new rats. Holy Rodent! Someone has discovered exponential growth and applied no limits. And E.Coli shall take over the world in the next 48 hours, except they never do. It’s the Mathusian Growth Model, without even Malthus’ limits. But it’s not just rats, think locusts and marauding urchins! Rats are just the beginning. Biologists have calculated that with the expected warming this century of 2 degrees Celsius, populations of dangerous crop-eating insects are likely to explode as temperate areas warm, reducing crop yields by 25 to 50 percent. Similar horrors lurk offshore, where biologists have found that a population explosion of purple sea urchins — “cockroaches of the ocean” — is choking out other denizens of Pacific kelp forests. In recent years, psychologists have accused conservatives of being more innately fearful than liberals, but that never quite squared with the fact that conservatives express less fear over environmental problems. There’s a difference between fear of real things, and fear of fake ones. Anyone who studies conservatives knows that they are afraid of losing jobs, quality of life, and the building blocks of a fragile, brilliant civilization. Anyone who studies the modern incarnation of “progressives” knows they worry about forests that are greening, crops that are increasing, and whether we have got the labels right on toilet doors. Naturally, we all can’t wait to go back to a time when CO2 levels were perfect and rat plagues never happened. Rats? Rats! In our retirement complex, we’ve been advised NOT to set out rat poison if we happen to see a rat. The OWLS resident in the area eat them, and might be poisoned themselves. So, if there is a rat problem, just encourage owls or similar birds. Problem solved – naturally! Oh yes! And BIRDS eat insects, too (so long as the ‘bird chopping, eco-crucifixes’ don’t get them)! Russ, but remember, Owls are Good Things, therefore they cannot increase due to ClimateChange. The rat population explosion is very real. Problem is they all seem to gravitate toward the Democratic Party!! a +1.4 degree C. global warming would be ! Good thing sceptics keep their numbers down….like owls….chasing rodents…. Rat poisons, these days, are anti coagulants (nor acute poisons such as Thallium or Zinc Phoshide). By the time a rat dies of blood loss there is no active ingredient left in their system (they are one feed anticoagulants now). There is absolutely no risk to predator birds so go ahead and kill those pesky rats, and feed the good owls. Trust me, I was the Technical Director for both of our largest pest management companies in this fine land, once upon a time. Rats I know not much. Mice will collect the poison pellets and sometimes store them where horses can find the stash. Very rare thing, but not good. Of course there are not many horses in urban sites, but where we live there are horses. We use traps, and cats, to take care of mice, and owls are around — sometimes taking a cat. We’ve got Coyotes, but fewer now that Mountain Lions have increased. All of this has nothing to do with the flim flam rat story. I’ve seen some pretty good large bucket traps for rats….rotating drink cans threaded axially onto a rod/stick over a large tub with water in it….suspend some food suspended above centre of bucket, rat tries to get to food, can rotates, rat goes for a swim, but sheer sides of the bucket mean damp rat , no escapee…..very effective. Then up to you how you dispose of the rats. Simple effective trap. 5 gal bucket half full of water. Float a layer of sunflower seeds with shell on the surface. Provide a ramp up to the bucket rim. Be sure to scoop out dead rats/mice daily and replace sunflower seeds as needed. Oh, and put it somewhere where your wife won’t hear the critters struggling to get out – just saying. I bet there has been nothing to define what A Plague of Rats actually is? So just what constitutes such a plague? Seeing more than one per day? I cannot see how a 0.7% increase in ambient temperature can cause the populations of common pests to plague proportions. Where are the food supplies for these pests to suddenly increase their populations to plague proportions to come from? Nature has a couple of cute laws: the population of any species of animal is driven by two factors: congenial conditions (survivability) and, most especially, food supply. An animal’s population can only `explode’ in the complete absence of predation,in which case, the explosion is followed by a collapse or crash. In other words: Populations of predators move in step with populations of prey. Are they now trying to tell us that increases in CO2 increase pests’ food by such a degree? Human food is so close to that which rats require, that wherever humans can and do live, there you find rats and cockroaches in quanitity. So a small increase in temperature from increases in CO2 will be good for human food too. Very good. I’m pleased by that. As Jo has pointed out, the idiots have discovered the geometric population laws first expounded by Malthus but have also chosen to ignore the Malthusian limits, which makes them idiots. If adequate food is not there the populations don’t expand. Given the number of Hottest years evah why haven’t their populations exploded yet? They know nothing about population dynamics and rates of growth. It seems we are more in danger from ever increasing hordes of ignorant, ill-informed, miseducated, stupid, mentally retarded Psychologists and English-Lit Majors. We just might have to consider how we can control their population. For a start we’ll have to keep them separate so they don’t interbreed, if that’s even possible. We don’t need to know more. This is simple leftist logic. A six year-old child could understand it. Mother in law was living out west of NSW in 1970s when they had a real mice plague. Whole paddocks appeared to “move”, it was just blankets of mice. They reckon you could hear the scream for a mile around…. Mice eat grain. They don’t need it harvested, they’re very efficient at doing that themselves. I bet the cats grew fat and gave up hunting the mice. For a while. I mean, why bother hunting them when you could just reach out and hook one as it went past? Mice are one of the few animals which breed so fast to be able to do that. I’ve seen video of one, it might have been the same one you’ve mentioned. Agree with the plagues you mentioned……. It still goes on even as late as mid 2018…. The “brazen” little rodents chewed holes through some ageing door screens and under the door.. The little darlings were so daring, they would even venture into the bedroom while you were reading in bed.! Any food items left out on kitchen benches were “fair game”..
Mum had to stop leaving bread out for breakfast toast.. after finding they just chew through the plastic bags.. They “polished off” rat sack like it was Xmas pudding ! I finally had to get serious when nothing was working to get rid of them..Professional baits won out in the end ! The plague was caused by the long dry drought conditions, and the mice finding a easier food supply, and warm motors in frigs and cupboards to nest, and rear more offspring ! Country Living! …maybe some “professionals” need to spend more time “in the field” and get their heads out of computer models.! maybe some “professionals” need to spend more time “in the field” and get their heads out of computer models.! I agree completely with Bloomberg. If the Democrats take the house we will be knee deep in rats. Pelosi as speaker. Fanatical with the gavel. A new look at Climate Change from a rat’s POV. Oh aye, this article does nothing for me … about plagues of rats n mice n men…. who said that again? Any way , what does “bug” me – it’s those Psychos (?) – the professors of psychology experimenting, or what then, with the Nation. Issuing all those dumb pronouncements about doom, etc. .. and how the Media laps it up – but not content with that, it’s surely all the froth n lather that WE as bloggers / commenters generate in the discussion of it. Come on man. Everybody knows the cure it in the adage “we are what we eat”. The commentary at 3.57 is apposite. We’ll eat ourselves out of it eventually. All those foll deprived of water…. we wash Solar panels daily to remove desert dust, and by-products of rats, …. one uses a heck ova lotov water that. better to use the poison. Better still is better crop storage hygiene. Plague of Justinian, Black Death, Great Marseille…cold weather doesn’t slow down the rutting and spread of rats. No more than a New York blizzard. You don’t try to dial in a better climate. You deal with the rats. Like Bazalgette dealt with bad water. The money spent climate-dialling (we’re in the trillions now) could be spent on fixing the actual problems. But maybe we’re not supposed to fix problems? Globalists are funny that way. Kevin Rudd’s last plea to the Chinese delegation at the Copenhagen Summit. Then there were the ten plagues in Egypt. The real problem was the deluge of frogs. When did the French invade Egypt ????? Yep climate change (LIA) causes(ed) rat plagues as in the ‘black death’ and witch burning. I dont think that was what they were thinking in this article. the models are getting more absurd each day. As we all know in this erudite and sagacious space, it’s all about the Club of Rome and those pesky Malthusian types. I mean the modern standard bearers like Ehrlich have been right all along. Too many humans- not the Rats that are the problem; according to these crypto movers and shakers. Unless of course you have a tsunami hit a city…..
“Every year, Australians face down cyclones and bushfires, but should tsunamis be given more consideration? Questioner Jenny Rahman says the most recent earthquake and subsequent tsunami that devastated the Indonesian island of Sulawesi in September brought memories flooding back of the time she was rocked by an earthquake while visiting family on Lombok in 2002. “It was like a train roaring through, it was so loud, we just ran,” she said. “The NT has a low-to-moderate risk of being hit by a tsunami. But the low-lying nature of most coastal Top End communities means even a deceptively small wave could cause damage. Experts believe the most direct and dangerous threat to NT is from fault lines near Timor-Leste. The north-west Top End from Wadeye through to the Tiwi Islands and around the Coburg Peninsula are believed to be most at threat. But thankfully, due to the long, wide continental shelf between the Top End and the fault lines to the north, tsunami waves would reduce in speed and take some time to travel across the water. Exploding rats would be scarier. Looks like they missed a bet for terrifying the suckers. Really a tangent here, but you made me think of Exploding White Mice. I’ve heard of some strange names of bands over the years, including one named Blink-182 that apparently takes some pride in a song named, wait for it, “Enema of the State,” and Exploding White Mice sounds rather better than that extreme. Before the day is over I’ll probably be made to egret bringing up exploding rats. One thing is sure however, there defiitely is no way to account for some people’s taste in music. If the herons don’t get you first. We have a grey heron coming around the house every day. Interesting to note some of their songs, A nest of vipers, Fear(late at night), Make it/Ain’t it sad, Prepare to die. I recall seeing them billed at a pub in Richmond in Melbourne in the early 1980s. Pity I never saw them. I do recall really good uni bands like the Hunters and Collectors, The Oils, The Enormous Horns, Paul Kelly and the Coloured Girls, comedy like Fast Forward, the Big Gig, Lost Trios Ringbarkus, Flacco etc. In my day it was Chain. I went to see Paul Kelly at the Palais in Newcastle in the ’80s. But it was the OTHER band that was totally awesome – guy played “Devil Went Down to Georgia” on a guitar, and you’d swear he was playing a violin! Charlie Daniels Band… Bloke could play. At the same time people were going nuts for Steve Miller, but the CDB were much better. Griffith Duncan Theatre, Newcastle University, Wednesday night 18th September 1974. Invited by a close friend I knew from our cricket club who was in his last year of Uni. Went and saw an obscure Victorian band on one of their first ventures outside of their home State. Great gig too. Loud! Remember it because it was odd to have a midweek concert at such an obscure venue. No one (I knew) in Newcastle had heard of them. Saw Renee Geyer at the same venue, as well as at her home venue, the 16 Footers Club on Lake Macquarie, with her original backing band Baxter Funt. Around the same time, and a little before, I used to also frequent the Savoy, a restructured old movie hall in New Lambton, made into a ‘disco’ of sorts, and the home band there, played every second Saturday night was the original Sherbet, when Clive Shakespeare played his beautiful lead guitar work. Newcastle got some great gigs in those days too, as a lot of big bands (Internationals too) toured there, mainly playing at the Newcastle City Hall. I saw the ‘Hooks at the POW pub here in Melbourne. Also Australian Crawl at the Bondi Lifesaver. I look back in horror, but it was great at the time. I think the best thing I ever saw was Kevin Borich jamming with Carlos Santana at the SCG. Top billing for that show was Fleetwood Mac, but Santana was my pick, and Kevin’s, no doubt. Reminds me of a David Walliams book (movie) about a dancing rat, It was supposed to be rats are very smart! Speaking of books about rats, The Rats of NIMH were a popular topic back in the early – mid 80s, at least at the school I went to. Who doesn’t like stories about super intelligent rats escaping from a laboratory? Have you seen “Willard”? Or read “The Rats” by James Herbert? Not to say the explosion of one eyed, one horned, flying purple people eaters. Before our hostess’ time, unless she has seen the Alvin and the Chipmunks version on U-tube. Sorry no link as from my phone. Perhaps my most favorite song. Takes me back to the fabulous fifties. I hated it, but it was repeated endlessly until even I (sort of) memorised the lyrics (such as they were/are). There was a 1958 Purple People Eater MKIII Corvette race car. A drag race funny car, 1975 FLYING PURPLE PEOPLE EATER Vega. The 1974 amc javelin amx was known as the flying purple people eater. I remember that one. It became popular for some reason I never understood. But it did have a catchy melody….or was it the words? Thankfully memory has blanked out all but the title. in the aftermath of WWII the world was a fairly serious place. That song was so silly that you couldn’t help but relax and enjoy the sheer stupidity of it. You couldn’t play it today though, with so many living in the twilight zone. There would quickly be a movement set up to save the “one eyed one horned flying Purple People Eater” from discrimination and to set up crowd funding to help them to have the horns removed and get another eye. No doubt 97% of the activists would have had a friend who had actually seen one while going home in the dark after a great party. Maybe we need to now just bark back at the loopy left, tell them to stop being prize fools and pull their heads in….poor behaviour only gets worse when its not corrected…. I laugh at them..makes them incadecent, so I do it some more…..I poke the bear until it self combusts…..
I’ve had enough of PC, I’m now openly refusing to put up with it and mock anyone who rabbits on about it. Mocking them works well – people quietly cheer, but often don’t show it…. Surely, Steve.. Its always better to be nice to these clueless fools. As you may have noticed, I am always very polite to them. I’ve certainly noticed your unique brand of being very polite to them Andy. . I guess you guys don’t realise just how restrained I am in my comments. For hundreds of years we have been aware of rats: their habits, their propensity to spread disease, their danger to humans and the ways of controlling them. For psychologists to now be warning us of their danger and to associate that warning with CAGW is just a sign of the times. I have no affection for Rats and my one hope and prayer is that local government bodies would just get on with their job of Eraticating Them. I believe the people pushing the climate agenda continuously project their true behaviour onto those they wish to control, talking about rats, plagues and parasites is revealing but its difficult to find an association for idiot savant. Jo, thank you for starting my morning off with a good laugh. I can’t help wondering what variant of LSD these Psychos are using, or for that matter most of the brainwashed green blob. 2 degrees rise ha ha, my local mountain got a nice thick white hat at the end of last month and there are reports that the ski season will start very early this year. I don’t give a rat’s arse what the “Delusional Warmists” are saying. All they say is crap, crap & more crap!!!!! Those who believe their “incessant rantings” no doubt would score “very lowly” in a Mensa Test. We are living in a climate of total madness – hopefully the imminent “Mini Ice Age (MIA)” will bring some sanity. Hopefully the Solar Physicists have it right, ie the MIA will kick in during the late 2020′s. Oh dear another 10 years of “crap, crap & more crap” to endure. MIA is well on its way, no problem, your wish will be granted. But it will be caused (they will say) by warmung due to nasty humans! I’m wondering just how cold it’s going to have to get and for how long before the Gullibles actually realise what has happened and what has gone wrong. That’s going to be amusing for a while. A plague of exploding rats – how cool would that be?! If only the ‘exploding’ gene could be grafted into politicians, academics and over paid useless public ‘servants’. I have already experienced such a plague. Back in the early 1990′s, I lived east of Lancaster, CA in the Mojave Desert. There had been a several year drought (a drought in the desert – oh my oh my). It had lasted long enough for the predators such as coyotes, owls, hawks, and the like to be reduced to a minimum. There were just a few human families, my cat, and tens of thousands of acres of tumble weeds, mustard, fully seeded desert grass, onions, alfalfa, and carrots. The onions, alfalfa, and carrots were irrigated but the spring had been very wet causing a massive overgrowth of weeds and grass in the unused fields. It was very ripe for a plague of rats and mice. My cat would leave me the choice parts of numerous rats such as noses, tails, livers, and feet each morning. The rat population had grown so fast, they had eaten the supply of food in the fields. In massive numbers, they crossed crossed the roads. They were so thick, you could not avoid hitting them. Especially, the ones who were eating the more than adequate road kill. A distinct smell of rodents along with the smell of rotting flesh filled the air. The next year, the predators returned. The rat population plummeted and rabbits started to repopulate the land. It happened repeatedly on a three to six year cycle. Overgrowth of weeds. Population boom of rats and mice. Rapid increase in the smaller predators. Population growth of rabbits. Then rapid increase in coyotes. Followed by a drought and an almost complete die off of predators and prey. Global warming and man caused climate change had nothing to do with it. It was just the way things were in the Antelope Valley region of the Mojave Desert. To rid us of climate-change rats. How should a sensible conservative view climate change? I have several concerns: the air of hysteria used to promote it as a cause; the science behind it; the remedies that are proposed to stem it; and the cost of those remedies. First, I am somewhat sceptical about the ideology of climate change, the phenomenon formerly known as global warming. I am wary of many who advance that cause. There is something pre-industrial in the desires and objectives of environmentalists who use apocalyptic warnings to spur us to adopt the changes they desire. In March 2009, Prince Charles warned that the world had only 100 months “before we risk catastrophic climate change”. That was 116 months ago. I can find only one word to describe the recent claim by the United Nations’ intergovernmental panel for climate change (IPCC) that to avert complete climate catastrophe, with wars, famine and disease spreading across the globe, what is now required is nothing less than “unprecedented changes in all aspects of society”. That word is totalitarian. It’s not that these people are undemocratic or authoritarian. It’s that they we insist we reorder the totality of our lives to fulfil their plan. Cormac Lucey Blog: How should a sensible conservative view climate change? It’s not hard to find one James Hansen (yes, that one!) predicting projecting that sea levels would be lapping at the door of NASA GISS in “30 years” if we don’t do anything. We didn’t do very much, nowhere near enough they say – and of course, it’s worse than we thought. That building – the famous diner in “Seinfeld” – is still nice and dry, no floods there. Back then, we had 10 years to “do something”. In 1998 we had 10 years, “or else”. In 2008 we had 10 years, “or else”. IPCC 1AR said 0.3C/decade next 2 decades. IPCC 2AR said 0.2C/decade next 2 decades. IPCC 3AR said 0.15C/decade next 2 decades. Each one lower than the previous. Yet oddly, all “worse than we thought”. Sure – emissions higher than projected, temps lower than expected, projections of the next two decades dropping at every review, obviously things must be “worse than we thought”. It might have ranged from nothing to Nothing, but it was just enough. India’s government needs to weigh consumer aspirations against fears of pollution as the country grapples with a surge in oil demand and an investment boom, writes Anjli Raval in a Financial Times “big read”. “According to government figures, more than 230m vehicles clog up India’s roads, up threefold since 2001, but it is still an under-developed market,” Raval notes, with the number of fuel stations having risen 40% in six years. “The rapid growth in India is set to support the global energy industry at a time demand growth for oil elsewhere is slowing,” the feature says, with a chart from the International Energy Agency (IEA) suggesting China will overtake the US as the number one user of oil before 2035 – with India not far behind. “Yet India is also battling air pollution and collaborating on international emissions policies, given its vulnerability to climate-related stress,” Raval notes. “In a country where fossil fuels account for 90 per cent of its energy mix, its choices have an impact on the environment as well as global energy markets.” The feature covers coal use as well as oil, quoting the IEA’s head of demand outlook Laura Cozzi saying: “Solar is as cheap as coal in certain areas, but the challenge is to keep up with demand and to do it cheaply”. Under its Charter and Agreement, which require it to be impartial on matters of major controversy, it receives the licence money collected for it by the State under the threat of prosecution. How can the State justify this, and why should TV owners be prepared to put up with it, if the money is used to promote any particular interest or cause? On many issues – from man-made global warming to drug legalisation – the BBC makes no attempt to be or even look impartial. The Corporation’s system for dealing with complaints is a disgrace. Initial queries do not even go directly to the BBC but are handled by service company Capita. The few which make it past Capita’s time-wasting battle screens are brushed aside by an Executive Complaints Unit (ECU) which seldom accepts that anything is wrong. We know that climate change is happening – but there are plenty of things individuals can do to help mitigate it. Here’s your handy guide to the most effective strategies. By Chris Buckley; Henry Fountain contributed reporting from New York. BEIJING — An environmental group says it has new evidence showing that China is behind the resurgence of a banned industrial gas that not only destroys the planet’s protective ozone layer but also contributes to global warming. The gas, trichlorofluoromethane, or CFC-11, is supposed to be phased out worldwide under the Montreal Protocol, the global agreement to protect the ozone layer. In May, however, scientists published research showing that CFC-11 levels in the atmosphere had begun falling more slowly. Their findings suggested significant new emissions of the gas, most likely from East Asia. Evidence then uncovered by The New York Times and the Environmental Investigation Agency pointed to rogue factories in China as a likely major source. “When it comes to definitive answers, I think we have to first emphasize that this mystery has yet to be solved,” said Keith Weller, a spokesman for the United Nations Environment Program, which helps organize the ozone layer talks. A spokesman for the Chinese Ministry of Ecology and Environment, Liu Youbin, told a news conference on Wednesday that inspectors had checked 1,172 businesses over recent months and found evidence of CFC-11 in only 10. “If it was just those small, illegal roaming producers, the volume could not be that much,” Chen Liang, an official with the ministry who oversees international cooperation, including in ozone layer policy, said in an interview. Mr. Weller also said the estimated new emissions of CFC-11, in the order of roughly 13,000 metric tons per year, appeared to be too great to come from illegal production alone. “More Evidence Points to China as Source of Ozone-Depleting Gas” there isnt any ozone depleting gas that was the other scam. This is just another scare ploy. TOTAL BS! What group, who? any credentials, there never are, just some anonymous group. I don’t know about urban rat plagues, but there have always been mouse plagues in the grain belt, averaging one every 4 years if conditions are favourable. When you get a good grain crop followed by a mild winter that doesn’t substantially reduce the existing mouse population you can end up with a subsequent plague. Cold winters kill; wet weather floods burrows to both kill and stop breeding. Minimum and zero-till cropping regimes used these days to protect the soil structure and stop erosion also allow mouse burrows to stay intact between crops, rather than being ploughed into oblivion like in the old days. While there is fallen grain on the ground the mice will continue breeding like mice, until they run out of food, then they start cannibalising each other and their numbers crash. Then there are the plague locusts that infest the drier areas of the continent including the grain areas. If left uncontrolled they will eat anything green — even green lead-based house paint on at least one occasion that ended their migration prematurely. They can produce several generations in a year and appear whenever weather and soil conditions are favourable to breeding, egg-laying and hatching. Warm, moist weather suits egg-laying, so if Australia gets hot and dry we should have less locusts, not more. Conversely, wetter years tend to be big locust years, good for breeding and with lots to eat. Plagues of mice and locusts have always followed the weather for blindingly obvious reasons, while urban rats do well when garbage disposal and sanitation are badly run and filth is endemic. Nowt to do with global warming. The sea urchin plague off Tassie a few years back was found to be caused by over-fishing the lobsters that just love a feed of urchin. Global warming was getting the blame there for kelp destruction and the urchin explosion too. Once some lobsters were re-introduced, the problem resolved itself. Magic. No more global warming. Rats need 2 things, like every other animal needs, to survive – food and nesting sites. Hot or cold, as long as there is abundant food and places to nest, there will be rats. There will be life, in general, really. Rats, mice, all other animals, birds, insects (and humans) – only get out of control when there is too much food and too few predators – in urban areas, that’s around restaurants, apartment complexes, abandoned and neglected areas where trash is dumped. Coyotes have learned to live in cities because there are plenty of rats and mice, and garbage, to eat. The best way to solve an urban rat plague is to prevent littering and dumping. Reduce the food available. 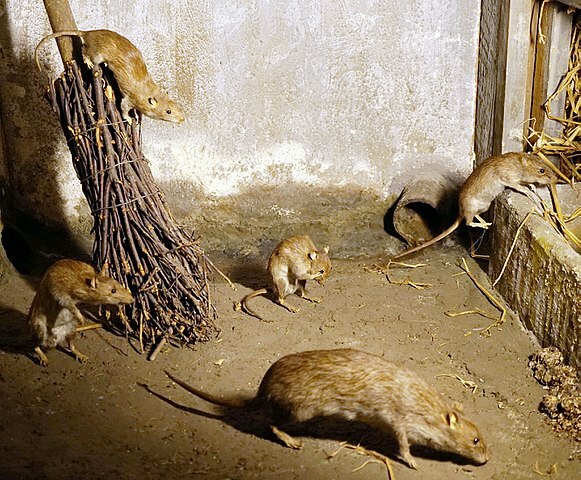 Don’t leave abandoned and empty buildings, rodent and pest breeding havens, standing until they become a hazard or fall over on their own – take them down. You get rid of an eyesore and a breeding ground in one go. Cyclic problems solve themselves, generally, but can be helped along with various traps, poisons, predators. But saying “Clean up your mess, the rats like it” doesn’t make a horror-filled headline. COAL shipments to India valued at $2.8 billion could be under threat because of worsening bottlenecks at Queensland ports and rail networks. The World Bank providing advice on energy infrastructure… this says it all about the global warming industry. In September Australia’s official forecaster, the Office of the Chief Economist, reported that shipments to India in the first half of this year had grown by 26 per cent year-on-year to 28 million tonnes. That implies annual shipments of 56mt. But the OCE has forecast that shipments will hit 75mtpa by 2020. So this really is a relationship that matters to Australia and its coal miners. Itochu, which is already a partner in Australian mines run by Glencore and Whitehaven, is gambling on early-stage investment to refresh, extend and geographically broaden its metcoal supply lines at the back end of a period in which incumbent operators have been relatively content to contain risk capital investment and enjoy the harvest time. finally, what’s left for the CAGW loonies? She says one Facebook group she is involved in is made up of “very grim baby boomers”. Protesters promising a new wave of civil disobedience linked to the extinction crisis are right to be infuriated by government inaction. In advance of his latest wildlife television series, Dynasties, David Attenborough said at the weekend that too many warnings about endangered species are a “real turn-off”. A few days earlier, the activist group Extinction Rebellion launched a campaign of civil disobedience by demanding a zero-carbon economy by 2025. Writing in advance of a protest in London that saw 15 people arrested, Green MEP Molly Scott Cato said she and others have been driven to break the law after spending years ringing alarm bells and being ignored. This type of nonsense can only breed in the closed confines of the smartphone enabled fool-asphere called social media. It becomes a self sustaining echo chamber but based on nothing excepts recycled stupidity. It struck me the other day, people “exist” on line, but like the movie “Player One”, only live to get online. I’m very much an off-line person , have no social media presence at all, and do miss out on some stuff as people send “invites” via places like Faceplant seem to monopolize peoples whole lives. Oh well, too bad. So while people are living in virtual reality, I’m actually doing real and useful stuff. As a society, its like living in a social media day dream….until rudely shaken by reality thats snuck up on them…. Losing track of reality is very dangerous to health and sanity. Hitler had the MSM of his day tightly controlled…..our version is the social media and search engines…..what could possibly go wrong? Speaking of rats, we are about to have an election in the States. About half of us will vote, to send people to our various capitals to govern us. media to the statements of those who would govern us, and decide that a mental asylum is not a good vacation spot. I am in one of those states where one party swears that, if elected, they will commit us to 100% renewables. a long list of technical accomplishments. will happen to some, not all. Insurance, according to this web site, is where, if you have a large expense, you pay a little to this business which immediately takes care of the expense for you. I thought “rights” were natural rights, like life, liberty, and pursuit of happiness. And civil rights, like protection of private property or equal treatment under the law. I guess I was wrong. Health care seems to be a “right”. College seems to be a “right”. A good job seems to be a “right”. Leave this sorry planet to the rat plague. Or maybe it would be easier to beam up a few thousand elites….the ones who always tell us how terrible things, and we, are. I’m betting the rest of us could muddle through alright. It’s hard to fathom how so many have little or no connection with reality anymore. The world may be able to limp along for a few years in a Social Justice fog but we are nearing the inevitable collapse. Politicians have ripped about as much as they can out of Western societies but they seem to think there’s still a lot left. I suspect that more countries will be doing “a Merkel”. Vote? in the USofA? I thought that was done for you by those pre-programmed voting machines. I live on the British Columbia West Coast in Canada. The sea urchins are just part of the food web of sub-tidal environment. They eat kelp. What eats them. Sea Otters, crabs wolf eels and other opportunists. In a dynamic ecology such as there is out here, there are ebbs and flows within the total food web. When the urchins are up, the kelp is down. When the urchins are up, the predators are up. This varies seasonally, yearly and in relation to diseases and a whole raft of other ecological factors. They are harvested commercially. In my territory, when there is commercial harvesting there is a huge bloom of kelp growth. Regional and local tidal conditions affect distribution. Salinity varies due to fresh water river discharge. Eating rat meat is considered a delicacy in Togo! This could be excellent news. Rat meat Togolese restaurants could open up across the world. No more of that terrible gas polluting farming of sheep and cattle and their horrible flatulent habits. What the head is full of…. Natural climate change won’t do anything, but that evil anthropogenic one will make a hell of misery. Grab them by the words. Anyone who studies the modern incarnation of “progressives” knows they worry about forests that are greening, crops that are increasing, and whether we have got the labels right on toilet doors. Deliciously put. Climatism unites vermin, roaches, rats and regressives. Rodents of a feather…..flock together…. All mosquito species use carbon dioxide as a long-range indicator that a host is nearby. Supposedly extinct kangaroo rat resurfaces after 30 years ..= climate change is resurrecting extinct species, YAY I can finally get a pet Megaraptor. I, for one, look forward to plague of locust night on the news, and welcome our new insect overlords. There are two stages to the new pandemic of interventionists masquerading as concerned citizens. First you get the announcement, the horror. “where biologists have found ” lays the ground work, the scare. Rats, mice, starfish, sea urchins, slugs, crop failure, vanishing caribou, cities, countries under water. So the urgently needed intervention. Only ten years to live. No cars, no cows, no coal. Consider robots scouring the oceans programmed to find and inject poison into our enemies, the starfish. This is despite the fact that in Tahiti such programs have been stopped because the natives have long recognized in their legends and traditional songs that regular and natural if unpredictable pruning of the coral by the crown of thorns starfish is greatly beneficial. For interventionist ecologists there is no time to wait. No time to learn. No time to assess and look at benefits and there cannot be any benefit from a slight increase in average temperature. Act now. We have just discovered something and it needs an immediate lethal response. The unethical and imaginary Precautionary Principle. Besides, you get funding. Lots of funding. Consider also $444Million, 7 tons of gold given without request for nothing in particular but allegedly to save something which does not need saving in a way not yet specified for a problem which in the long term may not exist. The Caribou largely, if not totally disappeared from Australia in 2009. There was a squadron of them seen in Townsville in that year. But since then, nothing. in 2000, According to Dr David Viner, a senior research scientist at the climatic research unit of the University of East Anglia, within a few years winter snowfall seeing a Caribou in Australia will become “a very rare and exciting event”. “Children just aren’t going to know what snow a Caribou is,” he said. That was truly sad, it always is when a great aircraft type is officially retired from service. Similarly for the Huey and the F111. I have fond memories of a couple of Caribou flights in particular. Blaming “climate change”™ for everything would be just a sick joke were it not for the fact that so many believe it. Maybe the “big Apple” wouldn’t have the potential rat population explosion problem if they’d stop leaving tons of rubbish on the streets in garbage bags and actually had a civilised society solution of enclosed bins and regular removal. Parts of New York only need residents to start throwing bed chamber contents out the windows to resemble towns of the dark ages. Also rats are endemic. I have read that in a major city you are never than 40′ or 12 metres from a rat. The population must be immense. Smart and hardy and omnivorous, they are hard to remove. You can only reduce populations, like mosquitoes. Populations can and do explode to match supply. As CO2 has increased 50%, photosynthesis will increase 50% and we will have a lot more to eat. World record crops, the opposite of the silly predictions, are feeding exploding populations of humans too. So what’s the problem? Rats, cats, dogs, birds, insects, cows, camels, kangaroos, insects. Is there no species on earth which is not our enemy? It all depends on your point of view. In India the ancient Jain believers often wear face masks in case they accidentally swallow a living insect. To Western eyes, the most amusing religion in India were the people on the street dressed all in white. They are the agnostics. Great religion. Makes sense. Believing in not believing in anything. They also worship peace. I live between a Lake and the Ocean with a major shopping centre not too far away. Every night my now deceased German Shepherd went on boundary patrol, as they do roughly every half hour, and would too often bark in the most savage warning manner. A neighbour discovered the reason, rats nose to tail heading along the top of the boundary fence twice a night in opposite directions obviously heading to the shopping centre rubbish containers. A couple of kilometres journey each way. Can we avoid encouraging fake news by repeating the warmista’s language? It’s not a 2 degree rise this century, it’s a 1.5 to 2 degree rise above pre-industrial times. But what was the pre-industrial average global temperature? While there are plenty of anomaly charts available, there seems to be little discussion of absolute temperatures. GISS reports the average global temperature in 2017 to be 14.9 degrees C, 0.9 degrees above the 1950-80 average, so presumably that’s at least 1 degree above pre-industrial times. So the IPCC’s warnings of disasters, and the rat scare reported above, will occur with another 0.5 degree of global warming to an average temperature of 15.4 degrees C – how frightening is that? And to add that the temperatures that are at sometime 19th cent. are crap, one thermometer in the SH! And that was in Indonesia, in the tropical convergence zone! meaning there were none at any latitude that is meaningful. Holocene records up to 8000 years before present, from several ice cores were examined. The differences in temperatures between all records which are approximately a century apart were determined, after any trends in the data had been removed. The differences were close to normally distributed. The average standard deviation of temperature was 0.98 ± 0.27C. I was referring to the McLean study of the HCRUT (fake) data based on thermometer readings over the past 150 years or so. NOT Ice cores. Ice cores are just that icecores they sample the temperature at the place where they were layed down, at the polar regions. “If we want to reconstruct past air temperatures, one of the most critical parameters is the age of the ice being analysed. Fortunately, ice cores preserve annual layers, making it simple to date the ice. Seasonal differences in the snow properties create layers – just like rings in trees. Unfortunately, annual layers become harder to see deeper in the ice core. Other ways of dating ice cores include geochemisty, layers of ash (tephra), electrical conductivity, and using numerical flow models to understand age-depth relationships. Still biased with GHG terms but that is how they try to measure it. Its not an exact science more of an estimate. It is an assumption to make that this represents the whole hemisheric temperature. And it is meaningless to average the earths surface temperature. Man, you’re brave venturing over to listen to the dark side. The Comrade Leader of the dark side was recently asked what she thought of POTUS DJT. To think, were NZ to have the skimpiest slither of the economic prosperity currently on display, it would be hogs heaven. And to think additionally, current new jobs in USA (4.5M) since the installation of the POTUS Trump’s administration, just about numbers the entire population of NZ. Pimple on a gnats bottom, klingon of vermin. L.D., it’s always advantageous to know what the enemy is up to. Anyway, I like to mix up my audio whilst driving – a little bFM (student radio) until it gets too raucous, maybe some Radio Hauraki for a 1970s screaming guitar solo (until the ads come on), some RadioNZ to hear what Official-Speak is being pronounced today (until an anti-plastic bag urbanite or crazy climate crook comes on, see above link to carbon fund charlatan), occasionally I’ll stumble upon an irie, reggae, rasta tune emanating out of some suburban backyard station, and I’ve even tuned in to Bach or Vivaldi or Tchaikovsky (especially when stuck in traffic – it somewhat soothes the soul). Since comments are closed on your other posts regarding the hot spot, I’ll post this here. If you actually read that 2006 report, then you should know why the post-1979 tropical troposphere cooling in the HadAT2 image is not real. Have you read it? They why not share the reason? Because you don’t know it? David is pointing out that if they were honest scientists they wouldn’t bury such a key, THE key point so deep in a long doc. They are always so triumphant when they figure out a new trick to “find” the hotspot, but they never admit it went missing. Hmm….. It still is all BS so it doesnt matter about the godamm hotspot. El Ninos CANNOT be driven by human anything. !! But its all you have. !! No “Hot Spot” except by extreme data torture and twisting and framing. In fact, there is absolutely ZERO SCIENTIFIC EVIDENCE of any warming by atmospheric CO2 anywhere, anytime. Whenever I see your name, I can always be sure it is followed by some copycat anti-science idiocy that shows you haven’t even the most basic clue what you are talking about. It is noted you were totally incapable of countering one single point that I made. Maybe you will be the AGW apologist that actually produces some empirical evidence of warming by atmospheric CO2. Surly you can find somewhere to copy it from! No warming for 33 out of 40 years. Only the 1998 El Nino, and a mathematical trend calculated from a now disappeared transient. And of course reality shows that the 1940′s was similar temperature to now, making even more of a nonsense of your fake graph. ! Dodgy temperature graph from SkepticalScience. Everything from SkS is dodgy, its who they are. That graph is just PURE FABRICATION…. the AGW way. No warming for 33+ years out of 40. A step-change at the 1998 El Nino.. and by the looks of it..
And if we round that 0.22˚C anomaly (1/5th of a degree) it’s very close to – oops! – zero. But never fear, those caring, all-knowing scientists at The Wishy-washy Post (where Democracy Dies in Darkness or something) have discovered – again? – the mysterious missing heat is hiding in the ocean. Can only mean one thing folks – we’re doomed! Just offsetting the red thumbs.. Watching climate change is very exciting. I agree with the premise as long as you can refer to politicians[ past & present] with economic agendas associated with AGW as rats. Further, people in power who do not have the moral responsibility to investigate even the simple facts before deciding the future of the nation are an insult to cockroaches. They do seem to be on the rise. Good to see a researcher that doesnt seem to blame everything ‘globul warmung’. Further down they mention the dreaded greenhouse gas thing, possibly due to ‘funding’ for their research. But they are suggesting that El Nino may be a sign of ice ages. I dont see El Nino causing an Ice age, maybe a sign, unknown. Nature.com can be a bit..politically correct. I will add events like El ninos need a driving force, non provided in this. I havent yet seen any provided evidence of any driving force for El nino La Nina cycle. Maybe its solar, OH NO we forgot that! ENSO is an enigma, outside of the other oscillations operating. Ian Wilson is confident the moon is a major player, his hypothesis will be tested over the next year. From my reading La Nina was more prevalent during the LIA, but I haven’t had a close look. A SEVERE heatwave that hit Toowoomba and southern Queensland across the weekend is set to continue well into this week. Bureau of Meteorology forecaster Sam Campbell said the mercury could reach a top of 35 degrees in Toowoomba today. “A hot air mass developed over the interior and then moved over to southern Queensland,” Mr Campbell said. Mr Campbell said there wouldn’t be that much relief at night either. “The main thing people will feel is the hot conditions persisting overnight,” he said. “Overnight temperatures will be staying up as high as 21 degrees, the average for this time of year is 15 degrees. The Bureau of Meteorology has announced southeast Queensland is sweating through “extreme” heatwave conditions, which is the rarest kind of heatwave. Tuesday’s hottest predicted temperatures in the southeast’s extreme heatwave are: Ipswich 40C; Gatton 39C; Beaudesert 39C; Esk 39C; Toowoomba 36C; Sunshine Coast 33C; Brisbane 33C. “On Sunday and until lunchtime Monday, there were seven patients who presented with heat-related conditions at public hospital emergency departments across the Darling Downs and South Burnett,” a Darling Downs Health spokeswoman said. only 33 in Bris! this is Queensland..Have they forgotten it supposed to be warm, now Queenslanders (courtesy of Yahoo7 news) suggest anything over 30 is a heat wave! Even 39s arent exactly out of the usual, its Aus mate! Thats whats flat dry continents do, they get warm. “Horsham residents were on the end of a barrage of ‘well meaning’ messages asking them how they were coping with the heat this week. Yes the heat wave alarmists are active. I have seen many of such heatwaves in November over the decades living in QLD. Some people must be too young or have only recently come from colder places. Look how Melbourne had its usual 4 seasons of late. The Cup was nearly a washout but ran in fine weather with cool days to follow. Normal every year. Melbourne had two months worth of rain in two hours. Yeah, completely normal mate, happens all the time. Can you do us a favour thanks mate, give us a list of all those heatwaves: saves me looking it up. Melbourne has copped a few of such downpours since we came here in the mid-eighties. They happen from time to time. It’s been known to rain in Melbourne once or twice in times gone by. Let me add to your education. Although I suspect that might make for heavy going. Wow. Missed the point again Sammy. Before you make a post, put your brain in gear, read the comments then have a think about them. A modicum of comprehension will enable you to formulate a sensible reply. On the theme of rats just before the US mid-terms. Yep, there are several DemocRATS running ! Lots of comments lately Andy old son. Like a lot of people, I know that a lot of an iceberg can be below the surface. What’s your point? It’s my opinion that if the Mueller “investigation” had any substantial and legitimate evidence, it would have been leaked before the mid-terms. I really do not think such a high profile, and politically charged process would be utterly devoid of people wanting to jump the gun to expose what, if anything, has been found. I guess we’ll see what’s what when the findings are made public, eh? Heard Obama on the mid term spruiking saying that he had never been indicted! Not yet Obama not yet but you and Hillary will one day answer for what you have done . Huge threat there mate: I’m sure Barack and Hillary will go into panic mode when they hear little robbie is gunnin’ for ‘em. Ahhh shucks stop it your embarrassing me ! I don’t have to do a thing robbie. You’re doing a sterling job all by yourself. At this stage its only speculation, but if impeachment proceedings go ahead then Mike Pence is heir apparent. He is a Washington man and should be able to get legislation through Congress more successfully than Donald. You may remember he came up with the Red Team Blue Team concept, which Donald failed to implement. Sad really. Last Wednesday, Carbon Brief hosted its fourth annual quiz night at a bar in central London. Thirty-five teams, featuring more than 250 people, took part in the climate and energy-themed evening, all hoping to win the coveted trophy claimed last year (again) by “BEIS Science”, a team of scientists working at the Department for Business, Energy and Industrial Strategy (BEIS). The teams competing this year, as in previous years, were made up of a wide range of people who, in one way or other, work on climate change or energy. The list included journalists, civil servants, climate campaigners, policy advisers, energy experts and scientists. Organisations represented included: the Intergovernmental Panel on Climate Change (IPCC); Department for Environment, Food and Rural Affairs (Defra); Committee on Climate Change; Sandbag; Carbon Trust; RenewableUK; Friends of the Earth; European Bank for Reconstruction and Development; WWF-UK; ClientEarth; Department for Transport; and five teams from the Department for Business, Energy and Industrial Strategy (BEIS). Teams from the Danish Meteorological Institute in Copenhagen, the Priestley International Centre for Climate in Leeds and Verisk Maplecroft also took part online. (A Queensland Fire and Emergency Services spokeswoman) said all occupants were accounted for. The fire was under control just before 8.40am and firefighters were monitoring the situation until an electrician arrived. The state government’s safety watchdog has taken the rare step of issuing the alert, after a random audit of work carried out by a local operator revealed problems with cables in the roof space. The solar panel installations were carried out by David Dare of Synergy Solar and Electrical, and the Technical Regulator has said it could be potentially dangerous and may pose a risk to customers. They’ve potentially got a risk of fire in their house or even electrocution should the worst happen,” Robert Faunt told 9News today. “We’ve found a lot of non-compliant work which has really concerned us,” he said. The business has carried out work across both metropolitan and regional areas and is known to have performed installations on behalf of other solar energy companies. “Potentially there could be hundreds of them,” Mr Faunt said. Nine News unsuccessfully sought comment from the business. The Office of the Technical Regulator has said it’s important that potential safety issues are rectified. Consumer and Business Services has said it is considering an urgent suspension of Mr Dare’s licence. The office of the technical regulator is also considering what further action it will take. - Arrived at 2pm, looked at the job, said they’d have to order some parts that will take a week to arrive. - Firefighters to continue monitoring the situation. oh, driving down bird numbers…because birds are avoiding the wind turbines! Scientists found that predatory raptor birds were four times rarer in parts of an Indian mountain range covered in wind turbines, ***suggesting they were avoiding the structures. They perch on the highest vantage points in the countryside with powerful arms and are reproducing at an alarming rate. They are the latest top predator in our ecosystem: the wind turbine. the food chain that made lizards change colour. They suggested similar effects would also probably be found around British wind farms. Science – Wind farms could absorb some of the energy from hurricanes before they hit land. The advantages of wind power are well-known. Wind is clean, plentiful, and renewable. Installing turbines in large numbers could help wean our carbon-intensive civilization from its addiction to fossil fuels. New research suggests that one day there could be another major benefit: massive installations of wind turbines could lessen the deluge when powerful hurricanes bring devastating amounts of rain onto land. During such recent storms as Harvey and Florence , which brought historic levels of rainfall , this could have meant less flooding and destruction, and fewer deaths. Did they even calculate it! The energy in hurricanes is more than a few H bombs. Absurd rubbish, should never get published in any reputable publication. journal Environmental Research Letters – is going from bad to worse. As more than two-thirds of us will be living in cities by 2050, scientists and tech firms are looking at new ways to harness renewable energy within the built environment. But at what cost? Vertical wind turbines will spin as traffic whooshes past, and pavements and roads will generate small amounts of energy from all those commuter feet and heavy buses and lorries pounding down them. Fleets of driverless taxis will give back surplus energy to the grid, and cities generally will make much more efficient use of the energy they consume. That, at least, is the vision of many technologists, environmentalists and city planners. Sir, – There has long been anecdotal evidence of wind turbines having serious adverse effects on human health; now thanks to a team led by Professor Christian Friedrich Vahl at the medical university of Mainz in Germany, we have an explanation for this. Professor Vahl’s team have discovered that low frequency noise or infra-sound, which we cannot hear, can weaken human heart muscle by up to 20% and can also alter blood flow. In an interview, he described the effect of infra-sound as being like a jammer for the heart. Given that the theoretical limit for wind turbine efficiency is 41%, the majority of the energy extracted by the turbines from the wind is dissipated as infra-sound. Worryingly, one of the characteristics of infra-sound is that it is very penetrating. Normal walls will make essentially no difference to it. The professor points out that to protect from infra-sound you would need a very high eight metre thick wall. Such a wall would have to be thicker than most houses and considerably taller. When we add the serious threat to human health to the other problems of wind turbines (expensive part-time electricity, turbine flicker, damage to the environment and, when construction is taken into account, not reducing CO2), it is clear that the time has come for a moratorium on new turbines. Otto Inglis. 6 Inveralmond Grove, Edinburgh. Interviewed in Allgemeine-Zeitung (LINK), Vahl said that the Low Frequency Noise generated by wind turbines can weaken the heart muscle and change the blood flow. This has been known cor twenty years but has been kept hidden by governments/workplaces and insurance companies to reduce liability for damage to drivers of heavy machinery like trains and heavy mining equipment. The deceit has been seen in the reporting of “noise” levels which made it appear that action was being taken. The skin and intervals, lung surface receive the impulse and it interferes with the normal brain function that is connected to the heart lung system. In the wake of the severe weather early in the week, the door will open for waves of arctic air to start blasting into the central U.S. Blustery winds will usher the cold air first over northern parts of the Rockies and Plains on Election Day. Voters will have to bundle up as AccuWeather RealFeel Temperatures will be held to the single digits and teens across most of the Dakotas. Snow creating slick spots on roads and sidewalks will make Tuesday feel even more wintery across North Dakota. The colder air will sweep to the south and east across more of the nation’s midsection at midweek with yet another arctic blast to follow late in the week. The average first snowfall for northern and western Kansas is typically in mid- to late-November. Farther south, temperatures will be marginally cold enough for snow, allowing for a mix of rain and snow in places like the Oklahoma Panhandle and Wichita, Kansas. Even resorts in Portugal and Spain are opening way ahead of schedule. Sulden in Italy along with Glacier 3000 in Switzerland said they will open slopes in the coming days. Some 200,000 homes were still without power across France on Tuesday after heavy snow fell across central regions on Monday evening, leaving hundreds stranded in their cars. Parts of the country are still on alert with the early wintry weather set to continue. Winter arrived early in parts of France on Monday and it took many by surprise, not the least the 950 motorists who were left stranded on roads in the Haute-Loire and Loire departments of central France when heavy snow fell on Monday evening. The heavy snowfall mainly affected the departments of Haute-Loire, Lozere, Loire, Puy-de-Dome, Cantal, Aveyron, Correze and the Creuse. But there were also wintry showers in Burgundy and the Rhone-Alpes. In parts of the Haute-Loire there were reports of 50 cm of snow falling in local areas. It was here where many motorists were caught out and had to spend the night in their vehicles after roads became blocked. The Route Nationale 88 was particularly badly hit. In the United States this is Election Day. DO NOT FORGET TO VOTE. It’s not only your right but it’s your responsibility to make an informed vote. Otherwise self government of the people by the people and for the people does not work. There is no unimportant election. Since I could vote — at age 21 in those days — I have missed only elections while I was in Saigon and one other when I became too ill to get to the polling place and it was too late to get an absent voter ballot. The polls are already open on the east coast and will soon open on the west coast.